Ahh, love is in the air with Valentine’s Day just around the corner. But are you loving your new hires? More importantly are they loving their jobs? Here are some tips to create a new hire program and lovin’ it! The initial weeks or months on the job are especially pivotal for new hires in establishing attitudes about their duties, their colleagues and your company. New hire orientation planned for this early period must not only provide job-related information but also foster a clear understanding of your firm’s philosophy and core values. Many businesses do not have the resources — including the time or money — necessary to develop an extensive new hire orientation program. But such a program is essential to make sure new hires are successful and to boost employee retention in the long run. The big-picture goal of new hire orientation, of course, is to help you create a rigorous, ongoing process of acclimating employees to their new work environment and expectations for the role. The devil is in the details, however. 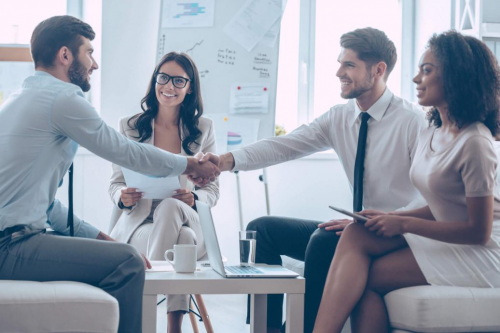 Here are some ideas about how to start your new hires off on the right footing through the development of a new hire orientation and mentorship program. New hire orientation is not a stand-alone event, but part of a bigger process, often called employee onboarding. Some view onboarding as just a new buzzword for orientation, but it’s actually your opportunity to do far more to ensure that new employees become productive and satisfied members of your staff. Depending on your company’s size and the complexity of the work, an onboarding program can last from several weeks to several months. It covers matters related to training, scheduled milestones, mentoring programs and interactive meetings where employees can ask questions about corporate or departmental initiatives. The first day: Ease anxieties — It begins from the very minute new hires walk into the building or onto the job site. Offer a first-day welcome to begin the process of making them feel at home. Have an agenda for the first couple days so the newcomers know what to expect. Personally introduce them to other members of the team. Schedule a lunch with the new employees and their managers on the first day. The first week: Reveal more about the company and the job — The first few days on the job are the best time to reinforce what you talked about during the interview process and build a sense of connection with the company. In a survey by Robert Half, 35 percent of executives whose firms offer an onboarding program said the greatest benefit is that it helps employees better understand the company’s values, guidelines and expectations. Provide the rules of the road — Make sure that new employees are aware of policies regarding their immediate work areas. Don’t take anything for granted, particularly basic considerations such as where employees park, how they sign in and, for nonexempt employees, how they clock in and out for work shifts and meal periods — and the importance of them doing so properly. It is also helpful to discuss office etiquette. Give a clear sense of tasks and set concrete goals — During the first week of work, newly hired employees need to sit down with their supervisors for an in-depth discussion about job responsibilities and goal setting. New employees should come away from this discussion with a crystal-clear understanding of expectations, tasks and priorities. In the process, the employees and supervisors will clarify the job’s objectives and, most important, work together to set specific, concrete goals for the newcomer. Align individual goals with corporate strategy — Managers must ensure that new hires fully understand the company’s strategic goals and are properly prepared to deliver through individual objectives that support this higher-level vision. When employees are aware of what they’re being evaluated for and what’s expected, they tend to do a better job. And when they’re encouraged to create goals that are in sync with something larger, workers tend to feel more of a sense of purpose and importance, which leads to a happier workplace. Mentoring programs have become a popular way for firms to assist new hires during the initial months on the job. By being paired with appropriate mentors (more experienced employees who act as a new hire’s guide to your workplace), newcomers gain valuable, real-world experience and skills that are difficult to transmit in classroom settings or workshops. Businesses that implement employee mentorship programs as part of their new hire orientation find a lot of benefit in them. Learn strategies for including these opportunities into your new hire orientation program. A key part of the onboarding process is thorough follow-up. You or supervising managers should meet with new hires at predetermined points: two weeks after the first day on the job, a month after, two months after, or at intervals that work best for each job’s complexity and take into account any changes in responsibilities. How well do they understand the company and their role? Do they have any questions that haven’t been answered? How has communication been with their managers? Do they feel prepared for their new role? Have the job-specific training programs the company has provided been helpful? Do they address the right areas? Are they worth the time being spent on them? What future developmental experiences would they like to see? The company values and best practices you stressed during the new hire orientation period should come through loud and clear, month after month — through the actions of role models such as supervisors and mentors, as well as through internal communications, such as employee publications and your company’s private network. In ongoing training activities, continue to make it plain that values such as respect for colleagues, commitment to quality service, and doing what’s right rather than what’s easy or convenient aren’t just first-day lip service but essential elements to your philosophy of doing business. Need a Staffing Association who cares? NISA supports your efforts and provides a network of knowledge! We hope you enjoyed this Nuzzle!